Battle of Fornost (1975 T.A.) 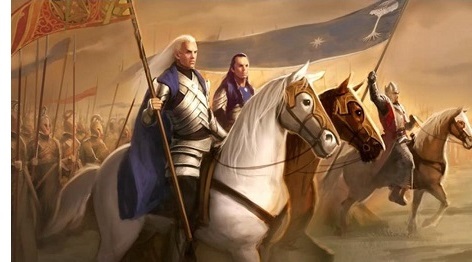 - After Angmar conquered Arthedain, Gonder came to the aid (albeit too late) of their brethren. "Then Cirdan summoned all who would come to him, from Lindon or Arnor, and when all was ready the host crossed the Lune and marched north to challenge the Witch-king of Angmar. He was now dwelling, it is said, in Fornost, which he had filled with evil folk, usurping the house and rule of the kings. In his pride he did not await the onset of his enemies in his stronghold, but went out to meet them, thinking to sweep them, as others before, into the Lune.